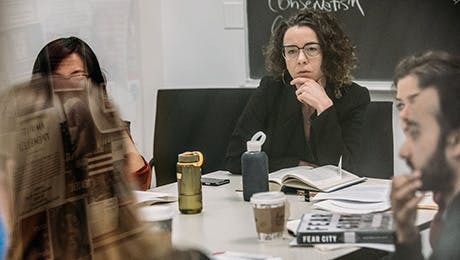 Courses in the Department of Politics combine a deep theoretical framework of political ideas with real-world implications. These interdisciplinary courses help students shape a better and more complete understanding of how politics work and why policies work. Through these courses, students will discuss the personal, national, and global implications. Why study politics? Should we value political knowledge for its role in political and civic life? Is it a way to gain political and social ends? Is political inquiry mainly a professional and scientific project? What are the relations between studying politics and sustaining democracy? To address these questions, we focus on basic concepts, including power, action, and freedom. What is power? How are force, coercion, and persuasion related? Is political action rational? What is freedom? Organized as a survey of texts and artifacts epitomizing core beliefs and practices typical of the modern world, even among contemporary critics of liberalism and capitalism, this seminar brings students with a primary interest in writing, publishing, and design together to explore a variety of themes and texts that epitomize some of the critical concerns of our age. A recurrent concern will be the paradox of trying to discern patterns in social interaction and history, and then, in accordance with these forms, to design a freer and more just society. This course provides a survey of qualitative methodology in social research. The first part examines debates regarding the value, place, and logic of qualitative research designs vis-à-vis statistical analyses. We evaluate the strengths and weaknesses of using intensive studies and small-N comparisons to describe, interpret and explain particular cases, and to make larger generalizations about the political world. The second part of the course examines various aspects of qualitative research design. This course provides a theoretical introduction to the growing study of the intersection of race and capitalism. A particular focus this term will be on the concept of “racial capitalism.” Widely used to describe the relationship between race and capitalism, the actual concept is slippery and has been used differently by a wide range of scholars in disciplines ranging from historical studies of slavery to political theory. The relationship between race and capitalism has evolved over time. Is the concept of “racial capitalism” capable of being a useful analytic for each key period of that relationship? This course explores the forces of state-building and market-making in 20th century China to understand revolution and socialist transformation, and the more recent embrace of capitalist and global economic institutions. Themes include popular resistance to states and markets; participatory and alternative modes of public policymaking; and regime identity and transformation.